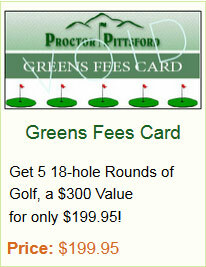 Many great ways to save at Proctor Pittsford Country Club. Proctor Pittsford Country Club Gift Certificates! Choose from 2 great deals! Includes 7 - 18 or 9 Hole cart rentals! A round of golf with cart included for only $50!